The Syncline Wine Cellars owner and winemaker tends toward the science of winemaking, and it is apparent when you read the tasting notes on their website. It is made in the Saignée style, where the skins remain on the grape for a short period of time to impart some color, but the juice (the must) is drained off before it darkens to the color of a red wine. Syncline uses a different blend for their Rosé each year, sampling some of the best grapes of the year from around the region. 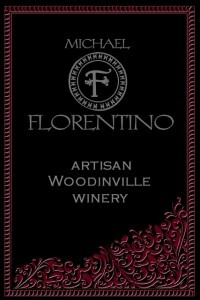 This year they sourced their fruit from the Columbia River Gorge (Pinot), Horse Heaven Hills (Grenache and Mourvedre), and McKinley Springs (Grenache, Cinsault, Couniose and Carignan). And throw in a bit of Red Mountain for good measure. 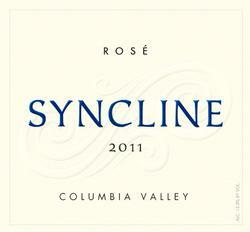 The 2010 Syncline Rosé is a blend of 33% Pinot Nor, 17% Grenache, 17% Cinsault, 15% Carignan, 9% Mourvedre, and 9% Counoise. Other than the Pinot Noir, these are all relatively rare grape varieties, and all ones that I have really enjoyed in other wines. This blend has a melon nose, with bit of grapefruit. It is a dry wine which has a brief taste of strawberry, but a lingering taste of honeydew and grapefruit. It has a very dry finish. Jon announced that it is one of the more complex Rosés he has tried. On a hot day, this wine will really hit the spot. I recommend it for when you are in the mood for a dry Rosé.